Helen has recently bought a new Kawasaki ZX1000SX Tourer and will be picking it up in a few weeks time. She has decided that she wanted the VFR put back to standard as the Giles Variobars weren’t cheap (£300+) and she will likely get some money for them on Ebay. So I have spent today uninstalling the Oxford heated grips and the Autocom unit. I have also removed the Variobars and fitted the original VFR clipons back on. We had to purchase a new throttle sleeve as I had to trim the other one a bit to fit the heated grips to it. It was a bit of a fiddly job but nowhere near as difficult as it was to install them in the first place. 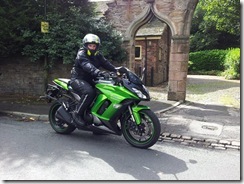 Helen had organised a test ride of a Kawasaki Z1000SX as she thought that it might suit her riding style. The local dealer was a bit useless at organising a test ride so she arranged a ride with MCO Kawasaki over in Orrell. We arrived just before 11:00am but the dealer was open and happy to see us. It isn’t the best location for nice roads for a test ride but there are at least a couple of back roads just South of Croston and Eccleston. We headed North from the dealers towards Shevington on the B5206. We then turned left onto the A5209 towards Parbold. We soon turned off though onto back roads and our first stretch of national speed limits. We had a decent play and eventually ended up in Rufford. We then headed North up the A59 to meet up with the other end of the A581 to Croston. We joined the A581 and expected to be able to test the bike but to our horror they have recently resurfaced the road with that the cheap loose gravelly crap. A good road has now been turned into a bit of a tiptoe affair for bikes. We stopped in Croston to take some photos and then headed back to the dealers. Helen was very pleased with the bike and has decided if the price is right that she will swap. The dealer eventually offered her a good deal but she is going to shop around to see if she can get a better one elsewhere. Helen's Review: Powerful, very responsive but not twitchy in the slightest, very good under slow manoeuvring (even managed a half decent U turn which is a REAL no-no on the Vif!) and not chuggy at slow speeds in town like the Vif can be. Awesome overtaking. Nice wide bars at a bit higher than mountain bike height (similar to my old BMW F800ST), so really comfy position, a bit higher than the Vif and it didn’t make my hands go numb like the Vif does so obviously my spine’s not in the position where it traps the nerve that causes numbness (had it within 5 mins of getting back on mine). Pegs feel a little too far forward at first but got used to it quickly. Didn’t feel exposed or plonked on it like a bar stool like I did when I tested the FZ1 Fazer a while ago. Seat felt OK but not sure how it’d be after 8 hours, but then I’ve got the Airhawk seat to try with it too. Am almost flat footed on it (heels both about 1cm off) with standard set up out of the box but the one I tested had suspension fiddled with (only done 700 miles so not due to sagging shocks!) and I was flat footed. Am flat footed with tiny bend in my knee on the Vif. Feels a smaller bike physically than mine. Steering on corners is awesome, didn’t go mental but I’d imagine it’d be easy to get pegs down. Back end twitched massively (I’m told by Debs who was following me) when I pulled back in after overtaking and tyre went over the dotted white line/catseye but it didn’t feel like an OMG moment like it would have done on mine. Croston bends to our disgust were covered in gravel as they’d resurfaced in that “chuck tar down with a load of cat litter” style but it felt not so bad as it would have done on the Vif. Similar weight to the Vif (228kg) but weight is lower (inline 4 rather than a V4) so it’s miles better balanced and doesn’t feel like it’s trying to fall over on slow turns and on stopping like the Vif (weight feels like it’s all between your wrists on the Vif) and I was miles more confident on those slow right turns where you’re waiting for a car to pass so you’re going so slowly then turn and off. Felt fine padding about and would probably be more confident than with the Vif on gravelly carparks etc. just down to the balance and weight distribution. Fuel consumption seems similar to the Vif, probably tank range will be around 10-15 miles less. Update: Helen managed to get Robinsons of Rochdale to match the offer, but with the added bonus of getting the colour coded panniers for free, which is a saving of around £300 on the same Givi ones she was going to get (Givi make the panniers for Kawasaki). Today we went for a ride into North Wales with some of the old crew off NUKB. It was a bit of a reunion ride as we haven’t seen some of them since Ella’s birthday last year. We meet up at Lymm Services and then headed on the M56 and A55 to Mold. 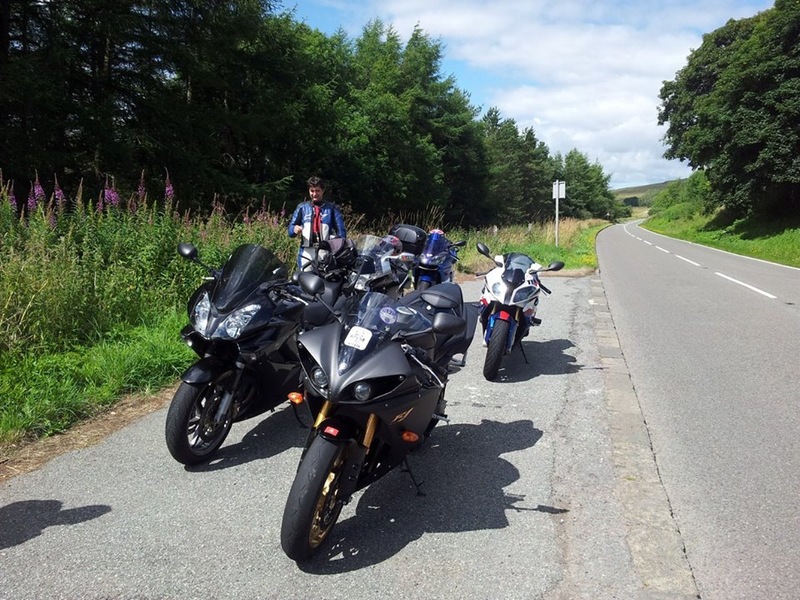 Here we joined the A494 and then followed the A541 and A543 to Denbigh were we stopped at a café to meet up with some other guys. We left Denbigh and headed on the A543 and then the A544 towards Llansannan. Here we joined the B5382 and headed across to the A548. We followed this to Llanrwst were we joined the A470 and then headed into Betws-y-coed. We filled up with fuel at the local petrol station but decided not to stop for lunch here as it was to busy. We continued on the A470 through Dolwyddelan and Blaenau Festiniog. We turned off the A470 at Trawsfynydd and headed on the A4212 to Bala. In Bala we joined the A494 and headed back North towards the A5. 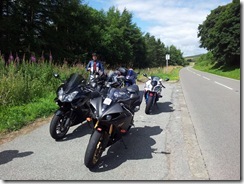 We joined the A5 and headed towards Corwen but soon stopped at Rhug Estate for our lunch and some Bison burgers. After a late lunch we headed for home the rideout sort of broke up into a few different rideouts at this point. We followed CJ the original rideout leader and headed North on the A494 towards Ruthin but soon turned off onto the A5104 and headed for Wrexham. Near Llandegla we joined the A525 and headed over to the A483. We turned onto the A483 and headed North to by-pass Wrexham. Just North of Wrexham we joined the A5156 and then the A534 and headed towards Nantwich. Here we joined the A530 and headed for Middlewich. We then joined the A54 and headed for the M6 but stopped briefly again for some fuel. We then headed home on the M6, M62 and M60. It was nice to see the old crew but North Wales is far to busy at this time of the year to make any decent progress. It is far more pleasant riding on back roads in the Dales than constantly having to overtake cars going stupidly slow.